World Cup has been my obsession these past few weeks at the expense of all my other interests. I can’t help thinking though about the respective Romani communities of the countries I’m watching playing on the field. For instance, this morning, Portugal, made me think of Ramón el Portugués (who is actually from Spain) and while searching for one of his famous tangos, I came across this excellent clip of Portuguese Gitanos. 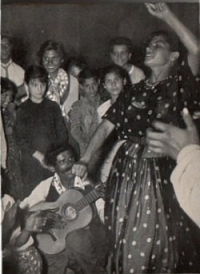 Amazingly distinct from their cousins across the border in Spain, their music sounds more ancient, more North African. The Moorish influence is very apparent.